The New Year is the perfect time for a wardrobe revamp. You've made all these resolutions. You're hitting the gym hard and paying a little more attention to what you're eating. You deserve a little reward for putting in all that work. At The Tailory, we think that a new custom suit is just what the doctor ordered. To give a little inspiration and perhaps help you decide how you'd like your new bespoke suit to look, we're counting down the hottest trends in suiting for 2018. If you're the type of guy who sports a suit to work on the reg, you owe it to yourself freshen up your wardrobe. There will always be the classics, but it doesn't hurt to try out the hot and new trends out there. If suits are special occasion, headed-to-a-wedding apparel, make sure you wow fellow party go-ers with your on-trend style choices. 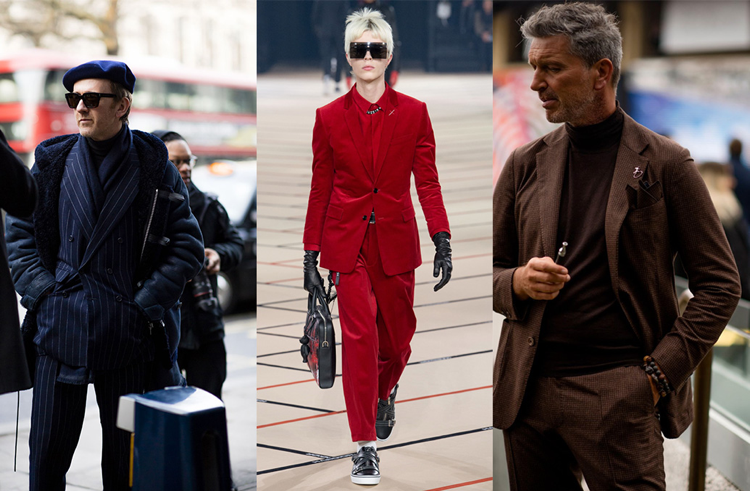 A favorite of street-style stars, the monochrome trend is one that transcends through all styles, not just suiting. While often, a suit is worn in a single color-way, this season is all about going above and beyond just the suit itself. We're talking everything from your shirt, to your tie, socks, shoes, and overcoat. A grey suit is a man's best friend. Wearable in every season, this "not-black" suit is a classic. If plain grey seems a little drab to you, try out a simple pinstripe or plaid. From stone to charcoal, there is a shade of grey for every man and every occasion. Pale greys bring lightness to grim weather. Charcoal greys are great for the man having a hard time straying from the black suit. At first when you picture an oversized suit, images that surface are those of the poor fitting suits of the 80s and 90s. 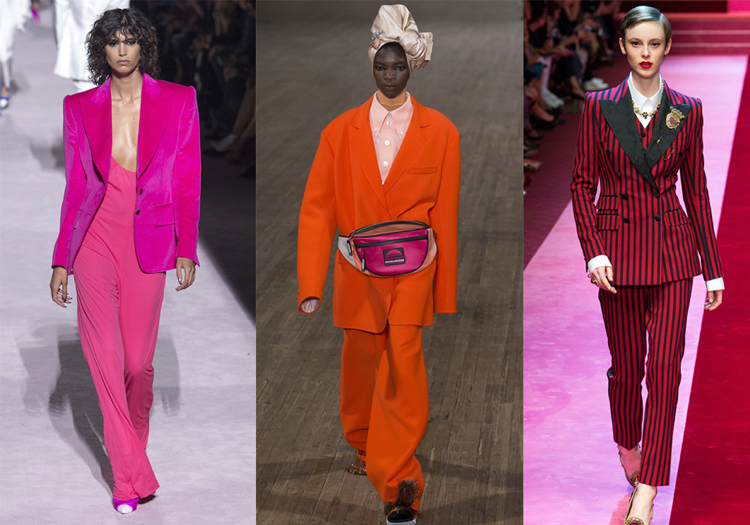 But once you see the suits done by Stella McCartney, Alex Mullins, Vetements, and the like, the oversized suits you once associated with your dull university professor will suddenly look a little more appealing. Now, oversized does not mean too big. An oversized suit should still fit properly in the correct places: shoulders, sleeve length, and waist. Where we are seeing, and liking, the extra fabric is in the length and width of the blazer and trouser. Both should take on a more relaxed fit. Comfortable and well-dressed; who would've thought?! If there is one trend we are certain of, it is suits for women. 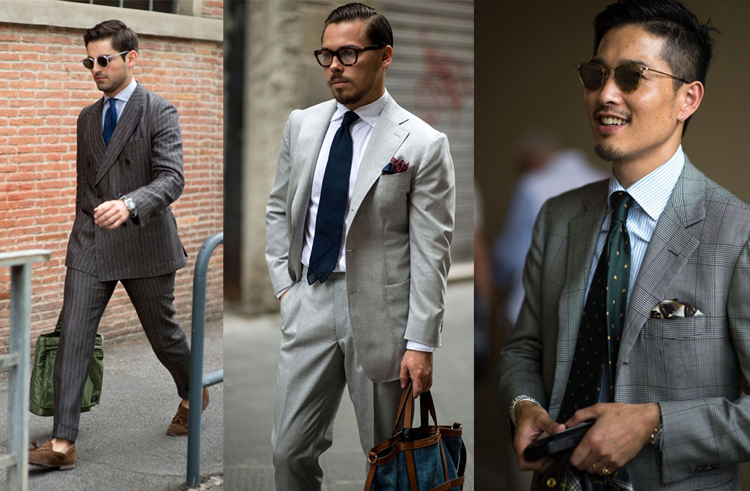 While some suits are trending more than others, if you are wearing a suit you are part of the fashion elite. Celebs on the red carpet are ditching the traditional satin dresses and brides are opting for tuxes rather than gowns. Ladies, suits are hot and you look hot in one. During the first few months of the year, the weather typically refrains us from wearing what we like as layers are mandatory and thick knits a must. For the ladies, what these winter months do bring are an excuse to wear more pants and jackets. Luckily, warmer fabrics like velvet and corduroy are making a big appearance. Not only do these fabrics keep you warm, their textures bring some depth and catch the light in stunning ways. Did we mention burnt orange is in? Wearing a suit is all about making a statement, so why not make an even louder one by rocking it in a bold bright color? Think ultra-saturated hues. Bonus points for rocking one in this year's color of the year: Ultra Violet. Feeling super daring? Why not rock a bright print, stripe, or plaid. Denim gets an upgrade this season. We're seeing gorgeous tailored looks in beautiful dark denims. The juxtaposition of the rugged qualities of denim with the elegant and polished look of a bespoke suit creates a jarring and stunning look that we hope is here to stay. Of course, everyone should have a classic suit in their closet. However, with tailored suits in the spotlight this year, it would be a shame to not try out one of the great trending looks. You're one-of-a-kind. Your clothes should be too. Let us dress you. The Tailory makes custom suits in NYC.